"The Muscle" 1981 GL1100. Hand bent bars, custom headlight on hand made bracket, rigid frame, hand made tail light license plate mount, bates solo seat, hand made fender seat. Hope you all like it as much as I do. Thanks, Will. hey budd ! nice job ....im goin tru the same thing here I got a 82 Goldwing gl 1100 and goin towards a bobber style but my main issue right now is to fit a seat with the extra material coming out of the fake tank...can you please take a picture from your seat facing the handlebar that I can have an idea of how you dealed with it please !! 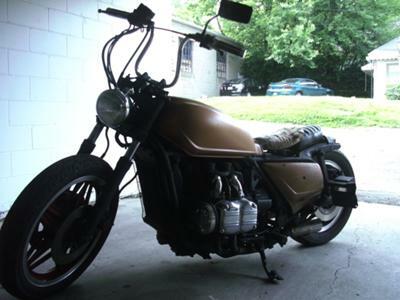 that is a really different chop my man.I cannot really get into a goldwing myself but I am glad you are contented and that is what matters.